A bottle of maple syrup made in Quebec. 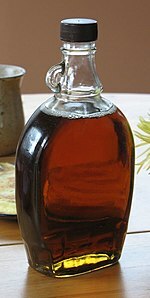 Maple syrup is a thick kind of syrup made from the sap of maple trees. It is made mostly of a type of sugar called sucrose, and is usually eaten together with waffles and pancakes. Sometimes, maple syrup is used to bake things such as pies, to make candy, or just as a syrup that adds sweetness to food. It is also sometimes used in making lemonade. It was used by eastern North America and later by European settlers. Syrups are usually packed when they are hot. The Canadian province of Quebec is by far the largest producer of maple syrup. It produces about three-quarters of the worlds maple syrup. In cold climates, maple trees keep starch in their trunks and root before the winter, but when spring arrives, the starch is converted to sugar/sucrose that rises the sap. ↑ "Maple Sugar Industry - The Canadian Encyclopedia". thecanadianencyclopedia.com. Retrieved 24 July 2010. ↑ "7038.pdf (application/pdf 객체)" (PDF). umext.maine.edu. Retrieved 24 July 2010. This page was last changed on 18 May 2016, at 14:53.